The first thing you’ll notice when you enter the original Taqueria Diana location in the East Village is the intense heat emanating from the vertical rotisserie behind the counter. Spinning in slow motion are sizzling strips of pork, well on their way to becoming carnitas. The taqueria is a mecca for Mexican street food, with tacos, burritos, and quesadillas, but it’s best known for its massive trays of nachos -- the queso version of which rings up at just $7.58. This is far from your average plate of nachos. 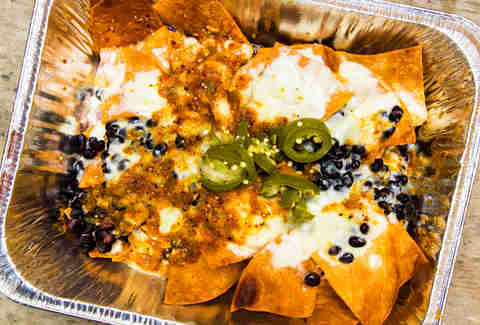 Taqueria Diana’s nachos arrive in a full-size foil steam table pan with no fewer than 50 crispy tortilla chips, blanketed with an impermeable layer of melted white queso that has a smooth texture and rich, milky flavor. With singed fingertips (it’s inevitable), you’ll unearth mildly hot poblanos and fresh, burnt-orange beans that hold their own; no need for mashed black beans or soupy pinto bean stew here. The salsa provides an extra bit of color and flavor to each bite, complementing the earthy beans with juicy tomatoes. A tray could easily be shared among two or more people; if you try and conquer it on your own, be prepared for leftovers to last you a second meal. If you find yourself wondering where all the crema or guacamole is, know that at Taqueria Diana, you’re getting simplicity at its finest. Your nachos don’t automatically come with such superfluous add-ons, but for good reason: The chips, cheese, and beans don’t need to be doused in other flavors. Still, if you insist, you can always get extra toppings on the side. Remy Haber is an Editorial Intern at Thrillist whose fingertips are perpetually singed from diving into trays of hot nachos.